The lotus reminds us that although adversity is inevitable, it doesn’t have to be unfavourable. We can become strong and beautiful, because we had to grow through the mud. The lotus is a Buddhist symbol for awakening to the spiritual reality of life. There’s tons of symbology here. Like, we know the lotus grows in mud. Just as we start off buried in the mud of our worldly concerns. But we can use Buddha’s advice to grow through the mire of ordinary life, and emerge sparkly clean and pure in the sunlight. Even the lotus’s leaves are self-cleaning ~ the rain naturally washes the dirt away. And so Dharma revitalizes all areas of our life. The stalk of the lotus is strong, just as we are strengthened by the Dharma… I could go on, but you know? This is a Path to explore, to find out for ourselves the truth of Buddha’s wisdom. With the mind-set that it’s just a little stretch – standing on tippy-toes – the sky really is the limit. “If we identify with our limitations, our failures, we limit ourselves unnecessarily.” (Kadam Morten) Better to start from where we are; and allow our thinking to expand. Buddha’s way of thinking is so very BIG as well. ☆*⋆We’re all born in the heart of a dying star •.¸¸.❤ comes via the completely delectable Professor Brian Cox. It’s an astronomical fact – the elements that make up “every living thing on the planet were produced in the heart of a dying star“. I love that, because from such a cataclysmic collapse come all the wonders of the universe. It’s a brilliant analogy for the little births and deaths we experience in every day of our lives, isn’t it? “Your world is a reflection of your mind. How we experience the world depends upon how we see the world. So if we change our mind we change our world.” (Kadam Morten) In every moment, the world we experience is our choice. This is true on many levels. That’s why Ghandi’s “Be the change you want to see in the world.” Really does work. On here there’s also a few special events on at Akanishta, Cheltenham and Amitabha, Bristol, UK, Both NKT Buddhist centres. There’s also the odd foray into world politics, but it doesn’t last long. Mahayana Kadam Buddhism found me when I was an Occupational Therapist in Scotland in ’95. I’ve been a full-on student of it ever since, including 5 years at Manjushri Centre in Cumbria. Highlights were the good fortune of chatting with Geshe la, being on study programmes with the blissful Samten Kelsang, and being on the building team of the first Kadampa Temple. I find Buddhist teachers from other traditions inspiring, and attend both our local NKT and Triratna Buddhist centres, because I like their different meditation styles. I like the Pagan way of viewing the world. It is age old and refreshing, and works in close harmony with mother Earth. Working with natural energies is empowering for all involved. I love using universal energy, with its potential for healing and spiritual development. I’m a second degree reiki practitioner, and feel grateful to be able to heal people and animals, and send cosmic energy through cyberspace to where it’s needed most. Now retired with Multiple Sclerosis (epilepsy), I work with the Spiritual & Pastoral Care Team of Bristol Hospital Trust; and use my artistic, geeky side help out with print design. ummm, i’m kinda’ in th dark here… how do you cherish others with a blog!? I think it would be great if you did interviews with kadampas – ordained and lay. Find out about how they integrate dhama into their lives, what are the challenges they face and how they overcome their difficulties! I’ve been thinking for ages of interviewing Kadampas all over the world doing vastly different things but still practicing Dharma. I just haven’t gotten around to it…!! Maybe we could come up with a plan….?! Well, I’ve been thinking about changing my name to Ike Kadampa! What do you think? I’ve been reading “Heart of Wisdom” for the last few hours and all I am thinking about is the importance of naming things. I have gone through hating my name to loving my name to spending several years in social media trying to brand my name to build up a business from scratch. I finally understand the importance of realizing the importance of not being the name I’ve been obsessed with. If I created a Buddhist blog I would call it “The Emptiness of Ike Kadampa” and each time someone read my blog post and if it was true that it helped them my comment would disappear! Just joking! I am “non-deludedly” proud to be associated with spiritual bloggers like you and Luna. Thanks for including me in your sharing of the Kadampa Dharma we love so much!! Thanks you for your kind and wise comments, I look forwards to reading more of them. You know there wouldn’t even be a blog without the FB page and all its supporters. We truly are reaching out to the world with Geshe la’s Dharma. It’s wonderful thing to be doing. I really like your new About page. I also still really like the idea of interviewing Kadampas around the world to see how they transform their lives with Dharma in wildly different fields — from trekkers in Brazil to businessmen in New York to actors to mothers to ordained Sangha etc. You’ve gotten started with this, but maybe at the next Festival you could go prepared and interview people, with the right questions to get the interesting answers! There are more Conversations with Kadampas coming – from earlier this year, all from Europe. I’ve been asking them what their best bit is. Their enthusiasm for the Dharma just shines through. It’s a challenge for me, I’m normally quite the recluse at festivals ~ avoiding the crowds and hiding under a baseball cap when I do come out for a coffee. But the spiritual path cuts through our comfort zones, doesn’t it. I’ll have to get some proper questions together. Maybe about using Dharma at work, or how it’s transformed difficult situations for them? What would you ask? So sorry Wendy ~ that was ages ago! I only knew about a couple of other blogs then, so couldn’t fulfil the award commitments. The awards are gonna go in a later post now… thanks again. Thank you so much for this new initiative in communicating the dharma. I’m usually not fond of blogs as I find them time consuming, and often irrelevant, however your first posting hit the spot for me and I’ll look forward with interest to the next ones. Hi, thanks for visiting and for sharing your thoughts and comments. I hope I write something that interest you in the future and that we will chat again. Peace & Blessings. Oh! You’ve deleted the Commonzense blog! I thought it such a clever name as well. Do get it touch when you write something else, I’d be interested to read. Geshe la’s beautiful, all lightness and bliss. He’s very gentle, but you can feel there’s great power there. His hugs were loving and light, and I remember he smelt like milk and honey. OMG. That’s far out man! When did you get to do this stuff? Did you get to ask him many questions? If I met Geshe – La I’d ask him if David Icke’s lizards were really Nagas coz they’re intelligent beings who can shape-shift too you know. You’re right about nagas, they helped the Protector Nagarjuna by taking some holy scriptures back to their realm for safekeeping. I don’t know if there is any connection between them and the Lizzies? It is something I’ve heard before though, and there do seem to be similarities. 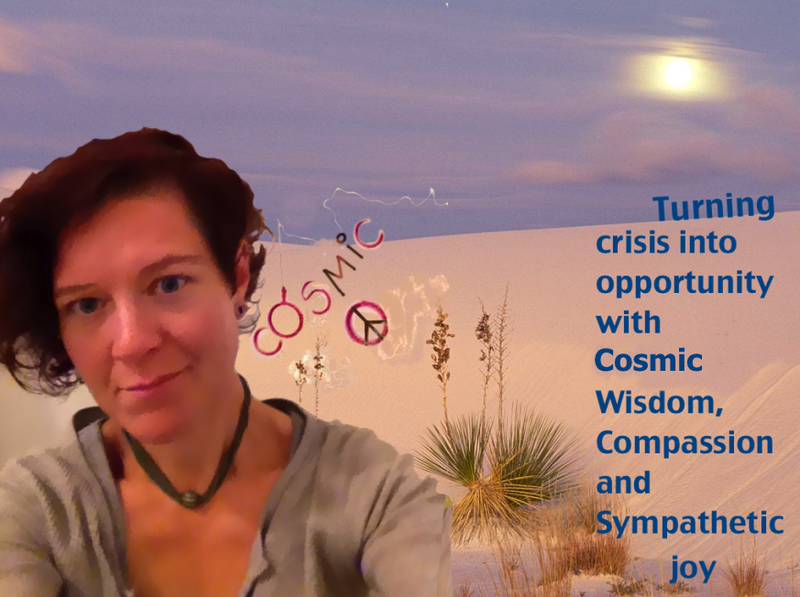 Crisis=Opportunity, Buddhism, Pagan and Reiki… we have quite a few things in common 🙂 I also happen to take a lot of interest in different forms of energy healing systems as well. Connecting with kindred spirits feels so special doesn’t it. Thanks for the follow ~ think I’ll reciprocate! Jas, thank you for stopping and liking yesterday’s post. I am pursuing meditation and some Buddhist philosophy to add more depth to my life. Just learning to stop and breath is so beneficial. I look forward to following your blog. Breathing meditation is amazing, isn’t it? Simple yet profound. You are welcome and I am thank you. Well met my dear 🙂 I enjoyed exploring your blog today! Blessings be. Thanks for finding my blog. It’s lovely to meet you. I look forward to reading more here. I have 1st degree reiki and keep thinking about doing more with that. Exploring what to do next..:) I love finding truth in different places. Like the twist and the feel of your blog. Thank you Laurie, it was lovely to find your blog too. Reiki’s amazing! I love that flow of energy and the surge of natural healing felt by yourself and the client. Feels like pure love. Your story inspires me. Your blog radiates peace. A lotus for you too, oh Buddha to be. Gracious of you! Be blessed.